Transplants to St. Louis from Arizona and Ohio, Emily Stuart and Andy Schreiber blend together elements of rural American music. Drawing from a catalog of original songs and 19th and 20th century folk standards, the duet weaves together syncopated string rhythms of country-blues guitar with vocal melodies that evoke the hardships and hopefulness of Appalachian Mountain gospel. Jonathan Ramsey performs melodic and percussive, brash and sweet, sometimes beautiful, often humorous, Irish-tinged songs. Energetic, upbeat, and animated, Jonathan Ramsey is always in motion on-stage, delivering his brand of Irish traditional and original songs and tunes. Audiences expect Jonathan Ramsey shows to include a wild mixture of original and traditional Irish songs of love, hope, and despair; ironic and folk-tinged covers; songs of plans gone painfully awry; and a bit of sassy social discourse. Some songs are gentle and melodic, others are lightning speed. Jonathan’s guitar, tenor banjo, and stompbox percussion support his Irish tenor voice with plenty of tunes, “solos”, and a strong and oft-danceable beat. Jonathan began his musical life early, acting, singing, and playing around the house. Thanks to his musical family and a pair of musically-inclined primary teachers, Jonathan learned the skills to use his overly-active imagination for musical good [instead of evil]. Taking up the guitar, he played with several folk, rock, blues, and jazz groups in his teens. A few years later, Jonathan narrowed his focus to solely Irish music. At this time, he began playing with Bully Ruse, a group he co-founded with Shelly Rao and Mary Hanover. He then performed solo at several Midwest regional Irish music venues, and across the U.S.
Not one to weep into a beer, he builds up from warm ballads to rebel songs, then on to pint-banging pub songs. Soon, everyone is grabbing an empty glass and joining the percussion. Jonathan is currently recording a new project. Percussive synth loops, swirling sculpted guitar noise, and floating choral vocals imbue northwest country with a glacial Gothic sensibility. Powder River is here to explore the darkest parts of Americana and the beauty contained within the void. 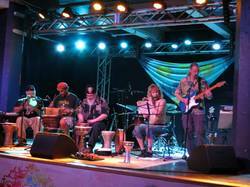 Spiral Rhythm is a group of friends that have been singing together for almost ten years. They began singing at bonfires, gatherings, and festivals. Slowly, they developed their unique sound complete with deep, multi-textured chants and explosive drums. 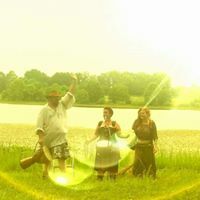 Spiral Rhythm has gone through many changes, but their goal has always been the same-to raise the spirit through voice and song. Folk rock, storytelling, and a whole lot of fun! That's what you get when you take parents who played on St. Louis' Southside in the 60's & 70's and mix it with a record collection that has everything from The Beatles to Pac-Man Fever, and from Springsteen to the Beastie Boys. Brian "Boo" Greenway is here to tell you a story, and he wants you to come along for the ride. "Boo" has been back on the music scene for the last 5 years, and he's a regular guest at Wolvenwold in Southern Missouri and Freeman Sanctuary in Paragould, AR. This will be his 5th consecutive year at the Pagan Picnic after a several year absence since the Unnamed Pagan Band days. Gather round gang...it's story time! We are a mixed Border team in St Louis, practicing weekly, usually on Sundays, at the Focal Point, 2720 Sutton Blvd in Maple...wood, OR, weather permitting, at the park on the corner of Sutton and Lyndover. We are an inclusive, patient bunch of people; we welcome new dancers, spectators, patrons and musicians. 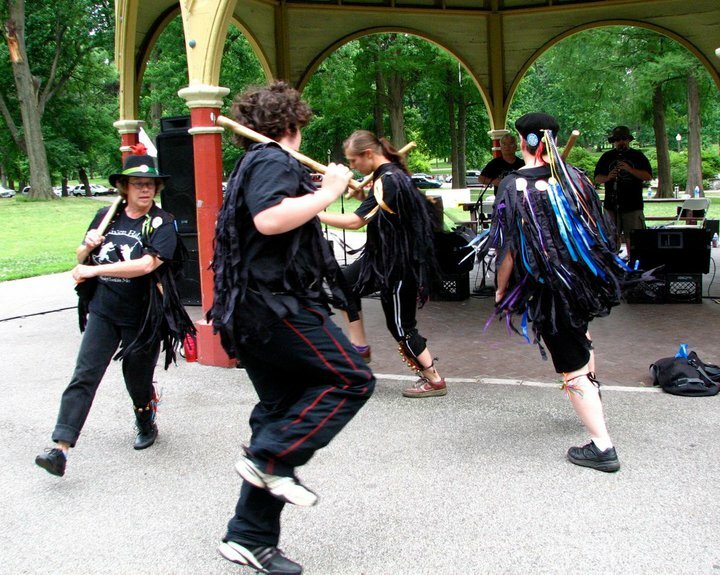 We dance for festive special occasions, including Mayday, weddings, funerals, NewYear, or because we feel like dancing. If interested, contact foreman Judy Stein (judycstein@yahoo.com) for more info or or to invite us to dance for your event. ​Sentinel Grove is the direct result of what happens when you bring together a nature whispering red head, a sharp tongued witch, and a tree hugging pirate; no one is sure how or why, but music is created. 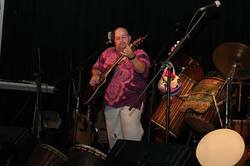 Their sound is as mixed as their personalities as they incorporate heavy drums along with blues, tribal, celtic, Native American, and other various influences into their songs. What brings Sentinel Grove together is their passion for spreading the messages they receive from whispers of the unseen.